Jumbo 4.3-inch display? Check. Dual-core processor for speedier, more efficient multitasking? Check. Support for 4G networks? Yep. The latest version of Google’s Android OS? You betcha. 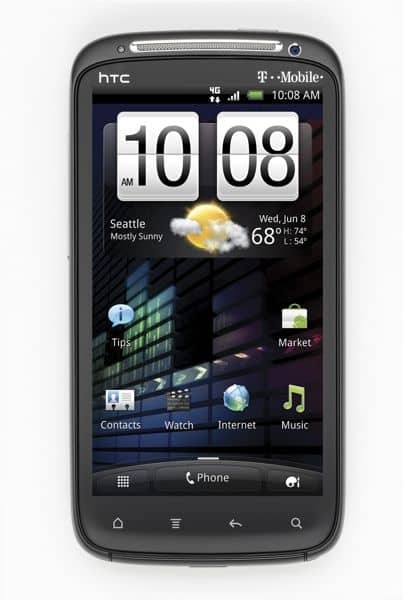 Meet the HTC Sensation 4G, a new Android superphone that’s slated to arrive on T-Mobile later this month. I haven’t had a chance to check out the Sensation ($199 with a new two-year contract, and after a $50 mail-in rebate) in person just yet, but the specifications sound impressive. First, the screen: we’re talking a whopping 4.3 inches diagonally with an ultra-dense, 960-by-540 resolution. That makes the Sensation’s screen a tad smaller than the huge 4.5-inch display on the recent Samsung Infuse 4G (check out my review); on the other hand, the Sensation’s ultra-dense pixel count bests the OK-but-not-amazing 800-by-480 screen resolution on the Samsung phone. The Sensation also comes with an impressive arsenal of optics, including an 8-megapixel camera, a dual LED flash (nice), auto focus, and 1080p-quality video recording, not to mention a front-facing camera for video chat. Last but not least, the Sensation connects to T-Mobile’s 4G “HSPA+” network, which the carrier is touting as its answer to Verizon’s high-speed, 4G LTE network. here’s the thing: On paper, at least, the HTC Sensation 4G makes for a worthy competitor to such high-end Android handsets as the dual-core Motorola Atrix 4G, although its top-of-the-line components may be overkill for casual users. Stay tuned for a proper review once I get my hands on a test unit.